On this great Marian feast day, we rededicate The Feminine Gift to the great mother of God, Mary most holy, who was taken up to heaven, body and soul. As we strive to imitate her in this life, may we one day stand with her in the Presence of God, our Lord and King. Come, let us adore the King of kings! 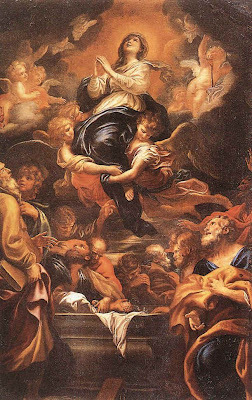 This day His virgin Mother was taken up to heaven. The angels rejoice; they bless the lord and sing His praises. Virgin most prudent, where are you going like the rosy dawn? Daughter of Zion, you are all fair and loveable; beautiful as the moon, bright as the sun. Hear, O Daughter, and see, and incline your ear, for the King has greatly desired your beauty. You are blessed by the Lord, O Mary, for through you we have shared in the fruit of life. Because of you, the gates of heaven were opened to us, You who this day reign gloriously with the angels! Behold, you are raised above the choirs of angels! Intercede for us with the Lord our God. Turn to us in your beauty and loveliness. Come forth in majesty and reign! Mother of the Eternal King, and our Queen! Make us pleasing to your Son, for all virtue, honour, and glory shines forth from you. O Holy Mother of God, we fly to your patronage. Our Mother, Our Queen, take us as your own!